Nicolaas Willem Hofstede was born in a family of militaries and Dutch East Indies travellers. He was named after his grandfather Nicolaas Willem Hofstede (1839-1909), who was colonel of the 4th Infantry Regiment. His grandfathers son Frederik Anton Gustaaf Lodewijk (1878-1941) was administrator at the Kebon Aroem plantation on Central Java. That is where on 10 May 1909 Nicolaas Willem Hofstede saw the light. Soon after Nicolaas finished his study in 1931 at the Royal Military Academy in Breda, the Netherlands, he left for Kota Radja in the Dutch East Indies. A year later he married Maria Rottier, also born in the Dutch East Indies. As soon as the Pacific War broke out Nicolaas was taken prisoner of war. His wife and two daughters were detained in civil camps. Nicolaas spent the war years in several POW camps, the longest time by far in Changi, where he kept a diary. 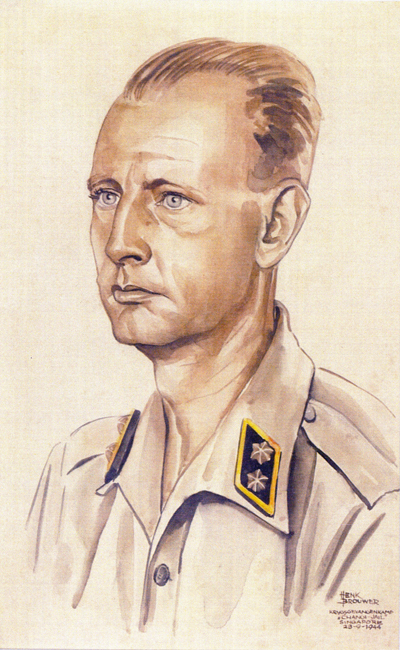 In Changi he was in command of a group of Dutch POW’s, who had to work, amongst other things, on the construction of Changi airfield. Probably Henk Brouwer was among this group. The Second World War had a huge impact on Nicolaas’ family – his marriage broke down. His wife took their children to Holland, Nicolaas stayed and, being a KNIL-officer, took part in the struggle against the Indonesian revolutionaries. He was promoted colonel, thus following the footsteps of his grandfather. After the war Nicolaas Hofstede started working out his diary notes and in 1978 his authobiographic ‘De slaven van Roku Ban’ (The slaves of Roku Ban) was published. This novel shows many similarities to Henk Brouwers manuscript. Like Brouwer Hofstede describes the concert the Dutch Christmas Choir, organised by Henk Brouwer, gave on Christmas Eve 1943. He even mentions that one day ‘Landstormsoldier Brewer’ had drawn his portrait as a way to thank him for the generosity with which Hofstede had given him his food when he needed that most. There, Hofstede also mentions the fact that this portrait got lost after the war. In the novel several names appear of fellow-pows who have also been portrayed by Brouwer. Unexpectedly, at the end of 2018, the portrait of Nicolaas Hofstede that was supposed to be lost popped up. His daughter Wilhelmine, who had emigrated to Canada with her mother when her parents had divorced, had found her father’s portrait among the personal belongings her mother left when she died. In November 2018 Wilhelmine came to the Netherlands with her husband and went to Museum Bronbeek to see the exhibition about the Changi Camp. There she proudly unveiled an enlarged copy of her father’s portrait in our expanding portrait gallery.